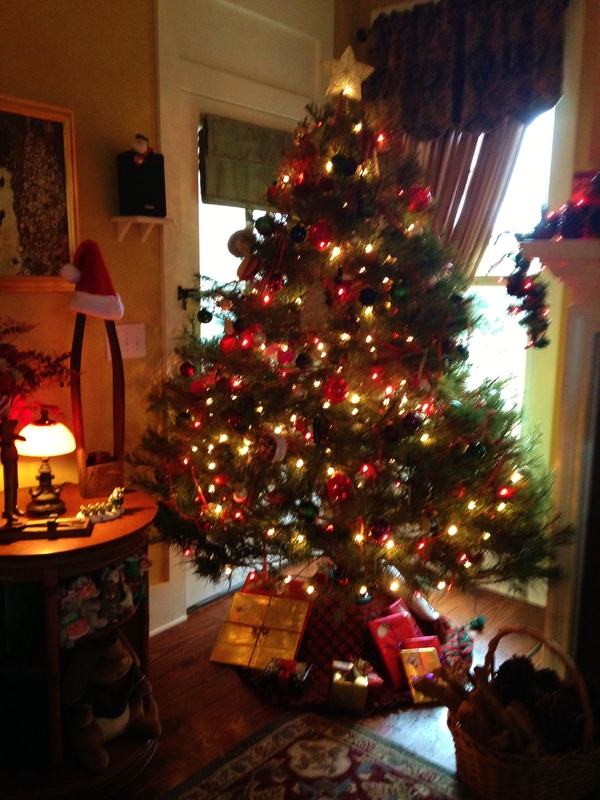 Years ago, a friend of mine said upon visiting my home during this time of year that it looked like “Christmas threw up in here.” Well, of course I took this as a compliment! 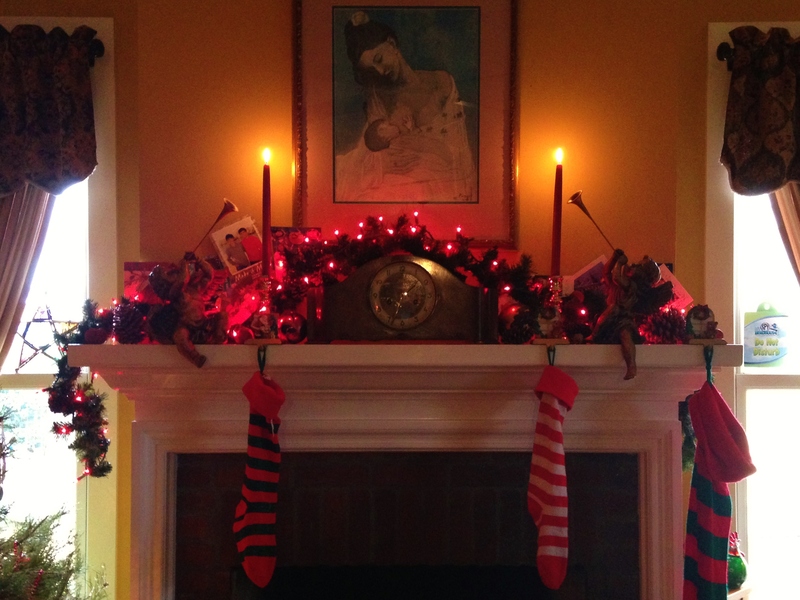 I decorate like a crazy person at Christmas and I pay no attention to tasteful, matching décor that looks like Martha Stewart has been all up in herr. I like color, shiny things and TOYS, TOYS, TOYS! This year I employed my army of Christmas beanies to give the joint a decidedly goofy charm and I wanted to share this Beanie splendor with you all. 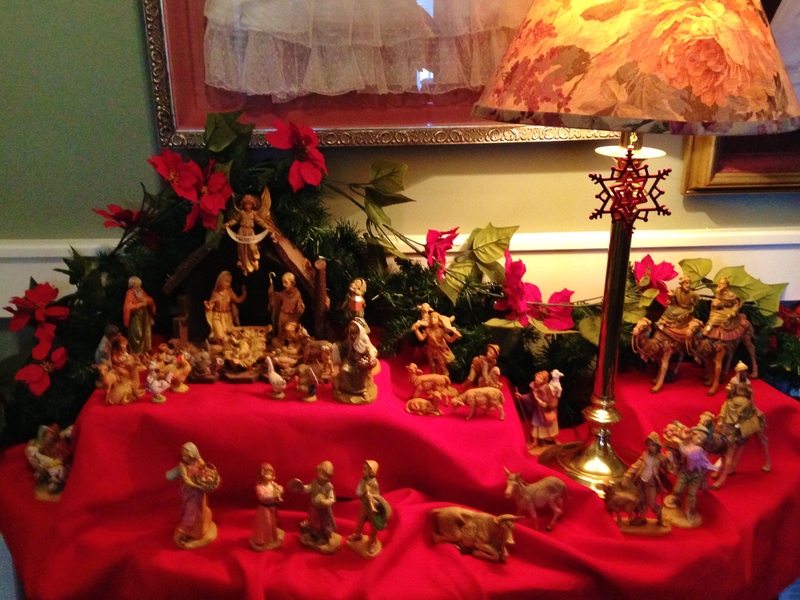 Some of my decorations are actually reverent. When my kid was little, she called this the “Activity Scene”. 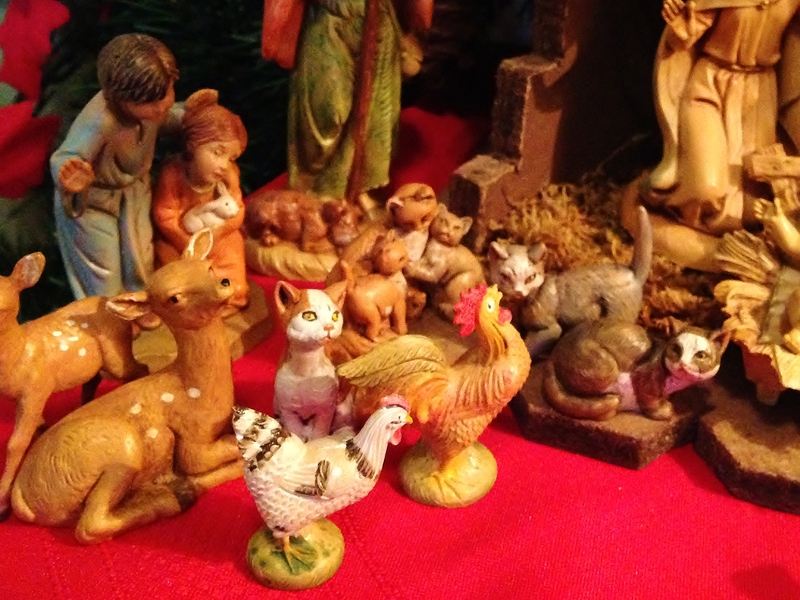 I have kitties, bunnies and chickens in my Nativity. Don’t you? 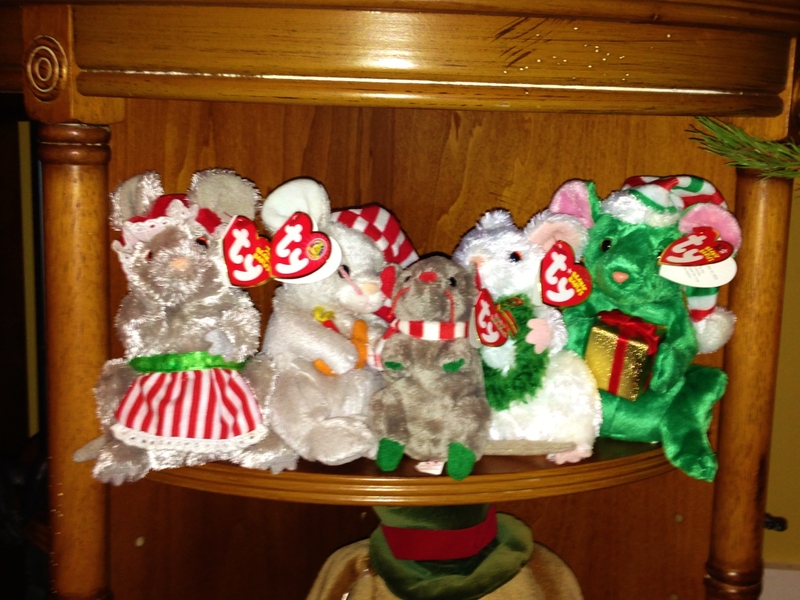 I do have a few traditional tableaux evident in my house. 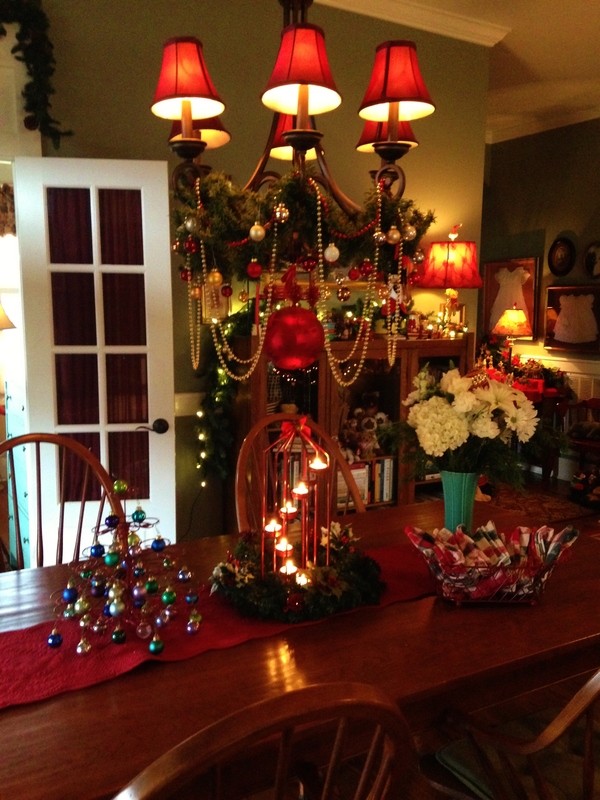 Decorated chandeliers and shiny, glowing things on the table. 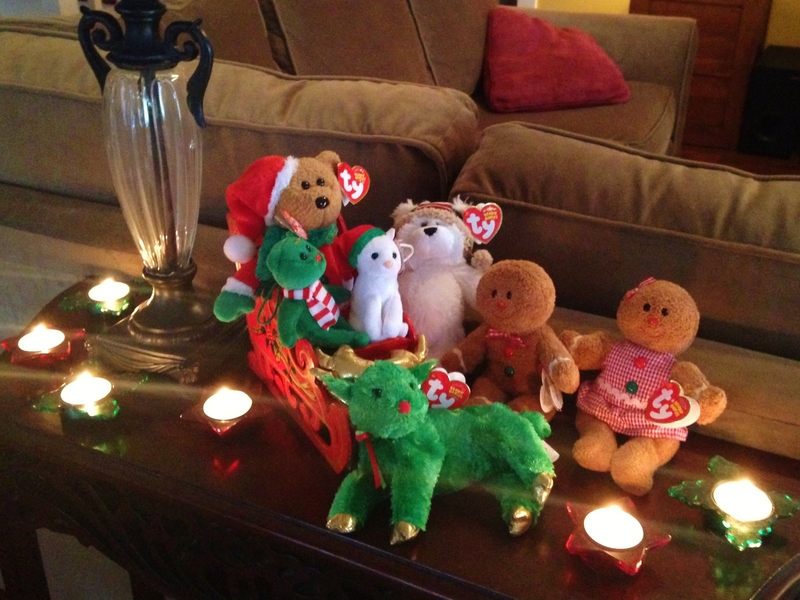 Tiny snow globes with Holiday scenes. 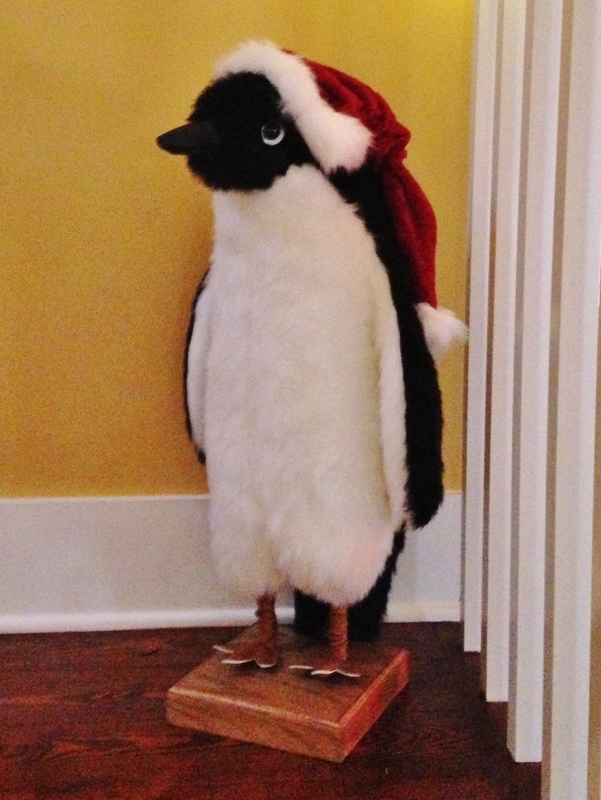 The mysterious Christmas penguin who magically appears on the stairs the day after Thanksgiving. 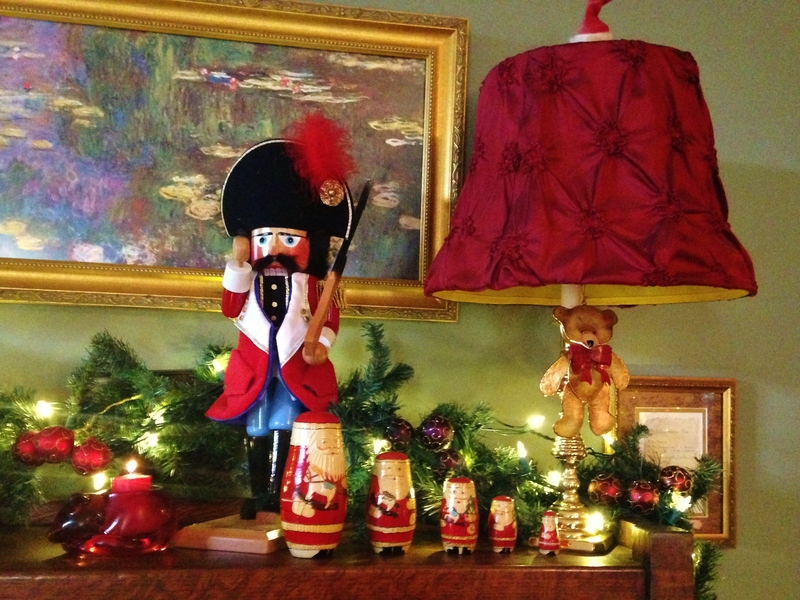 Mr. Nutcracker stands guard over the nesting Santas. 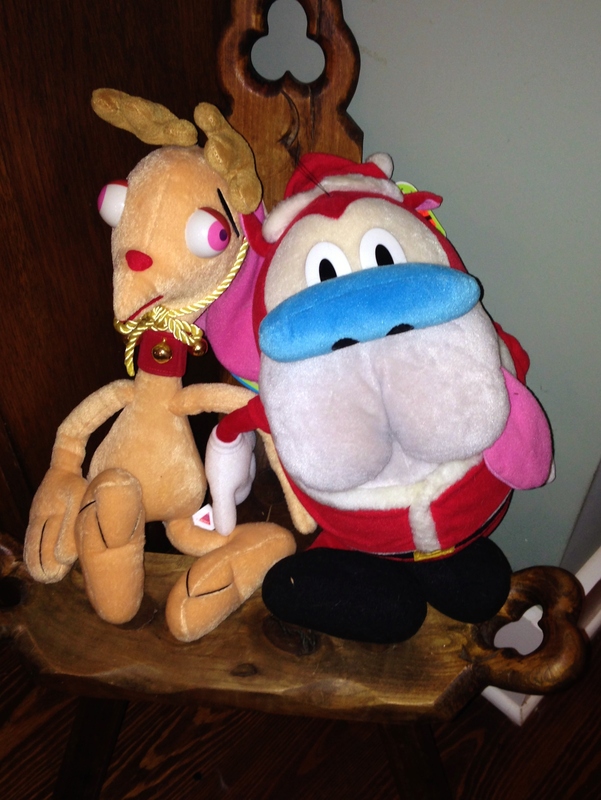 And of course everyone has a Ren & Stimpy for Christmas, right? 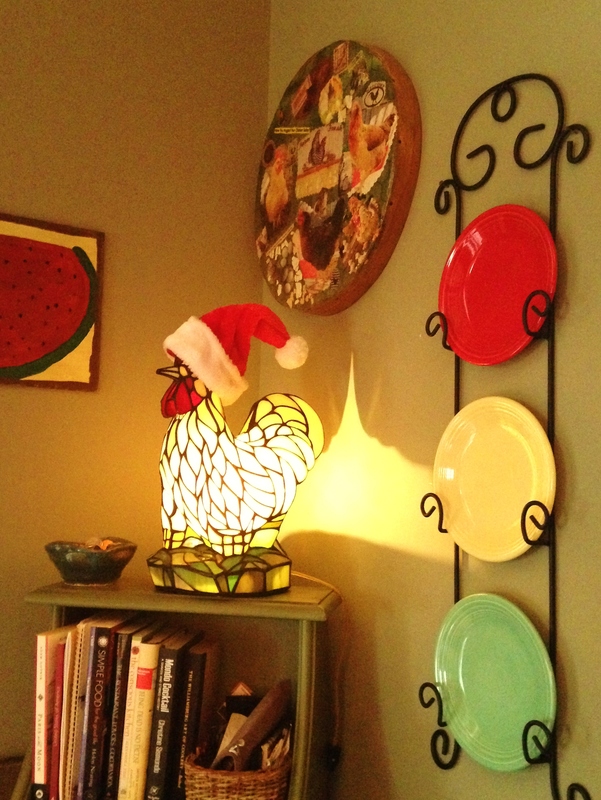 And the traditional glowing chicken wearing a Santa hat. What? You don’t put a costume on your bar sink faucet? 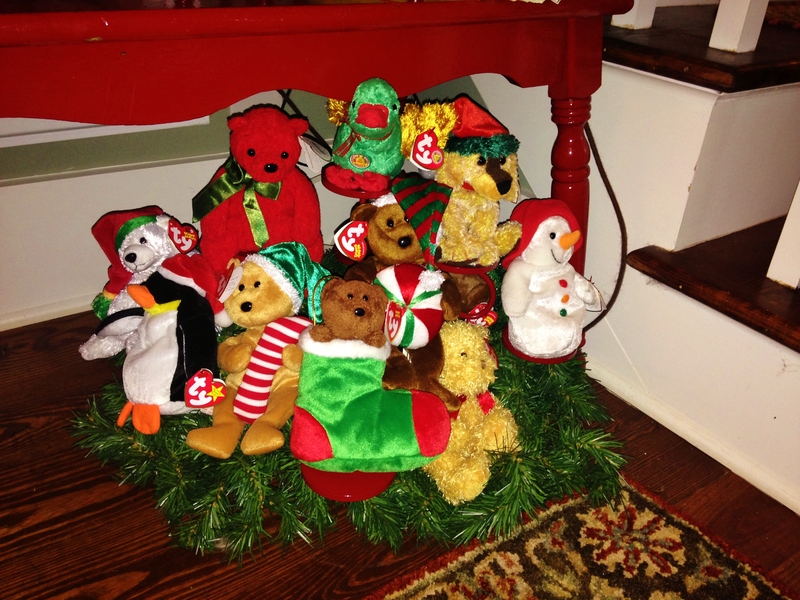 A Christmas tree made of Beanies. 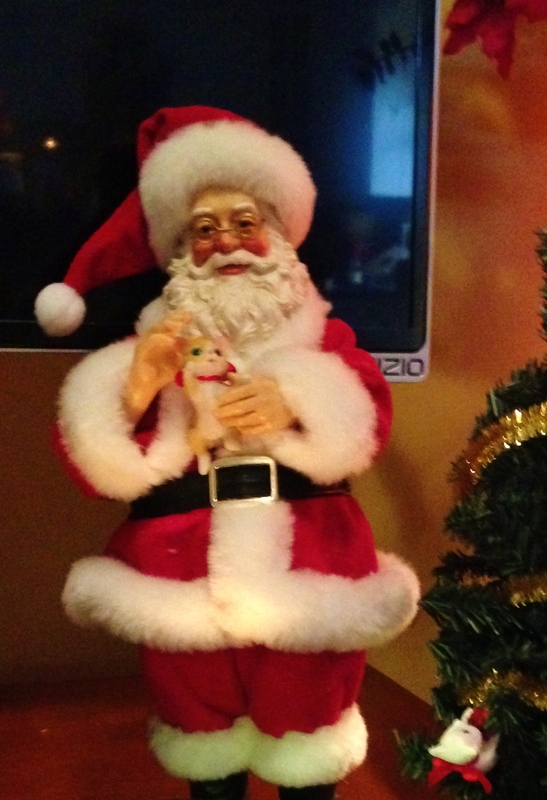 Lurking in every corner, waiting to give Christmas cheer. I hope you enjoyed my crazy decorations. I wish you all a happy and peaceful Christmas with your families. 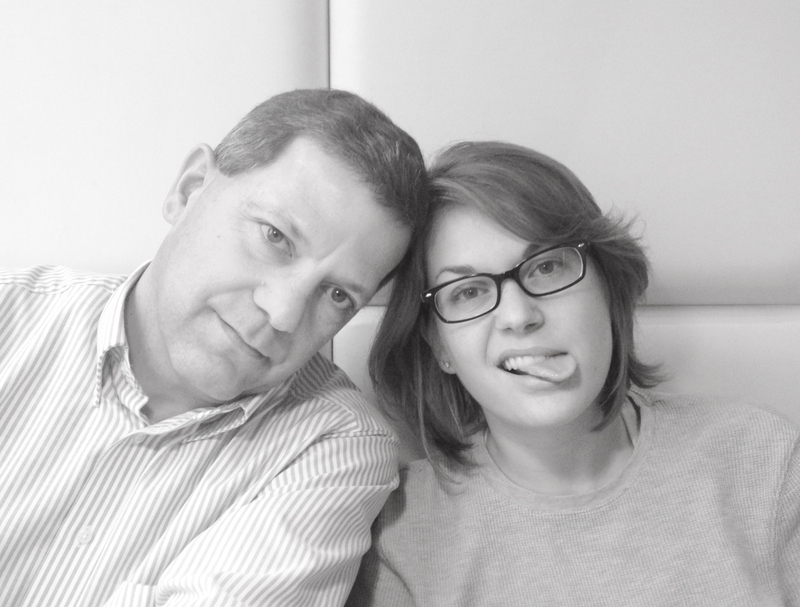 Howdy friends and neighbors. It’s been a couple of weeks since I posted anything, and although I don’t really have a theme for today, I’ll try to entertain you with some tid bits of information and some nifty photos. 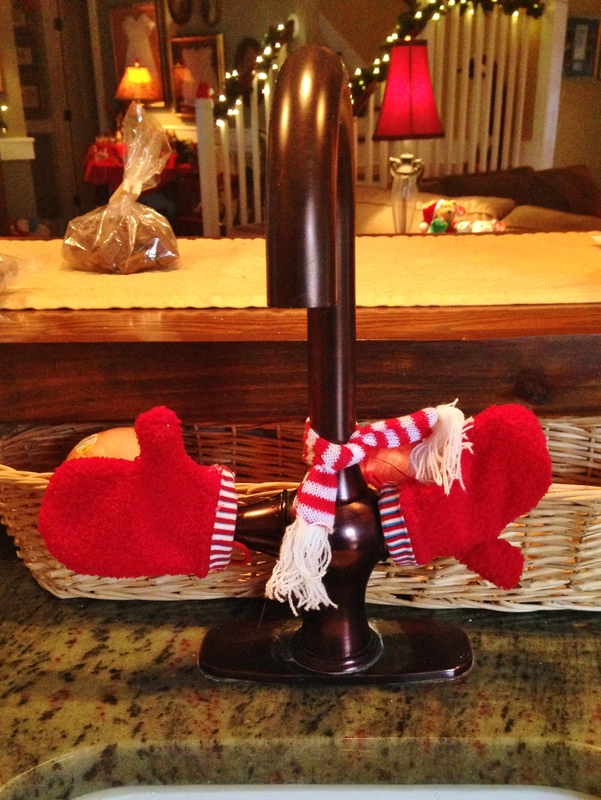 I began decorating for Christmas and Rowdy & Sam took many opportunities to enjoy the chaos and turmoil. 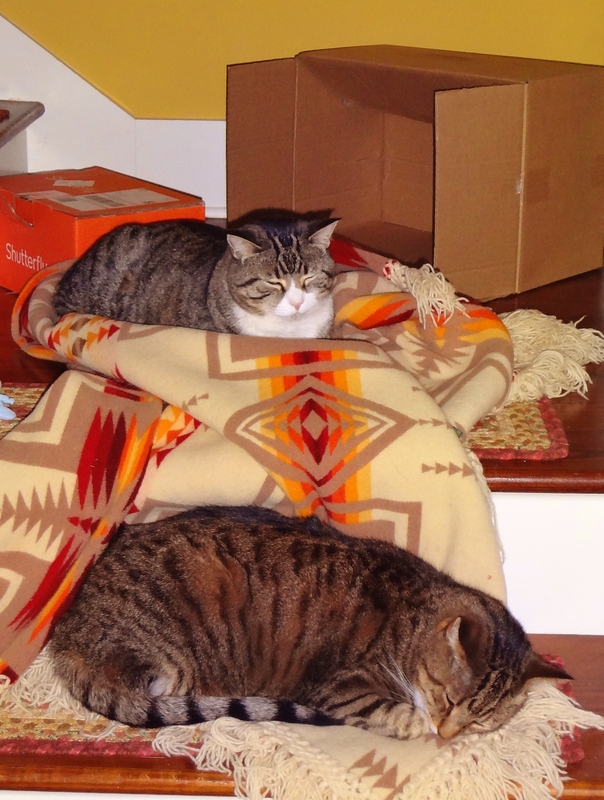 We think you should leave this comfy blanket on the stairs all the time Mom! 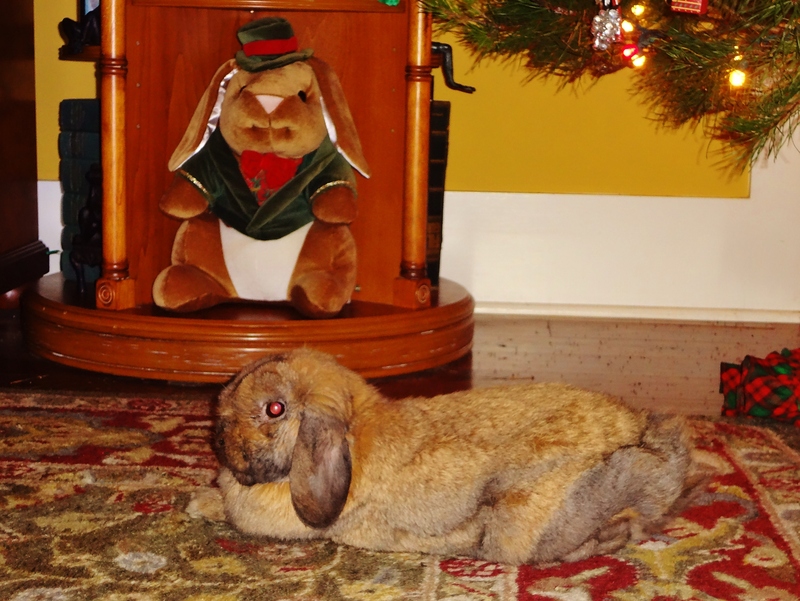 Buster was particularly fond of this dapper Christmas bunny. Why can’t I have a vest and hat like that guy? 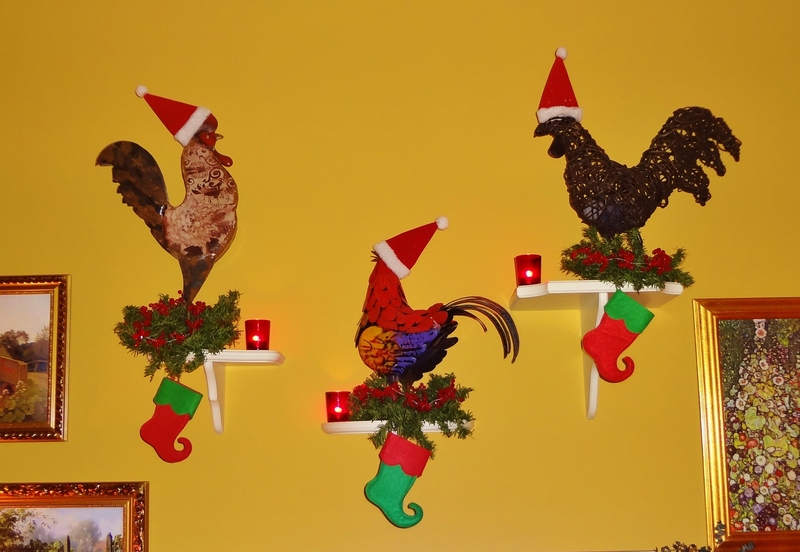 Of course my chickens always help to add to the Christmas décor. Chicken and Christmas both start with CH! I’m always having brilliant thoughts like that. 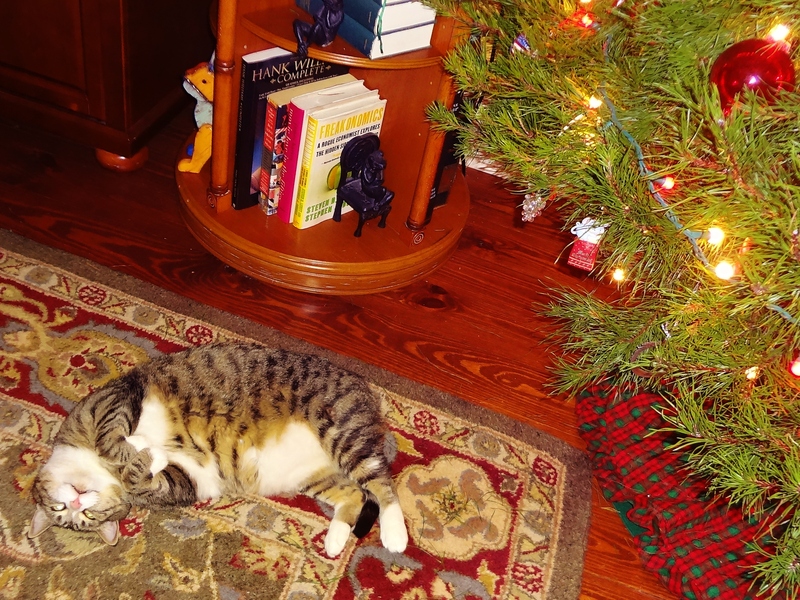 Rowdy is always enthralled by the beauty of the Christmas tree. 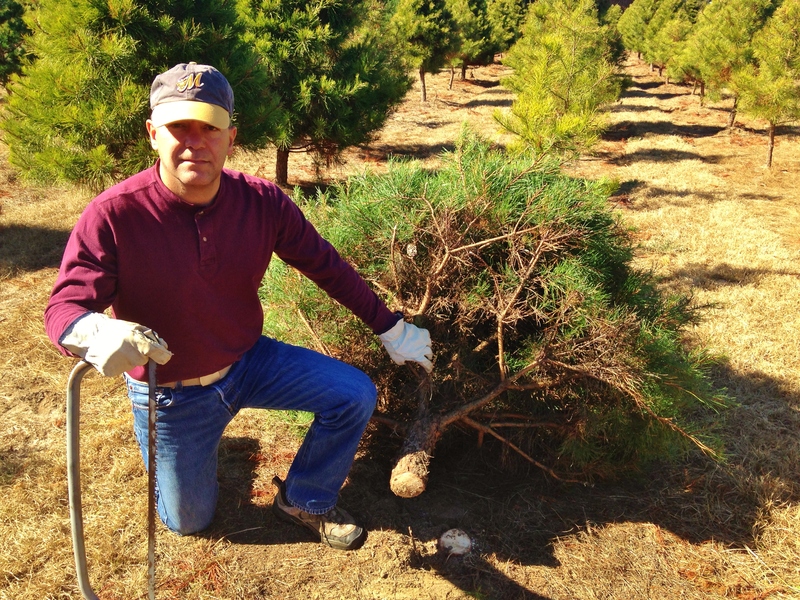 Of course she might be horrified to learn that her beloved Daddy hunted down and killed this tree with his bare hands! 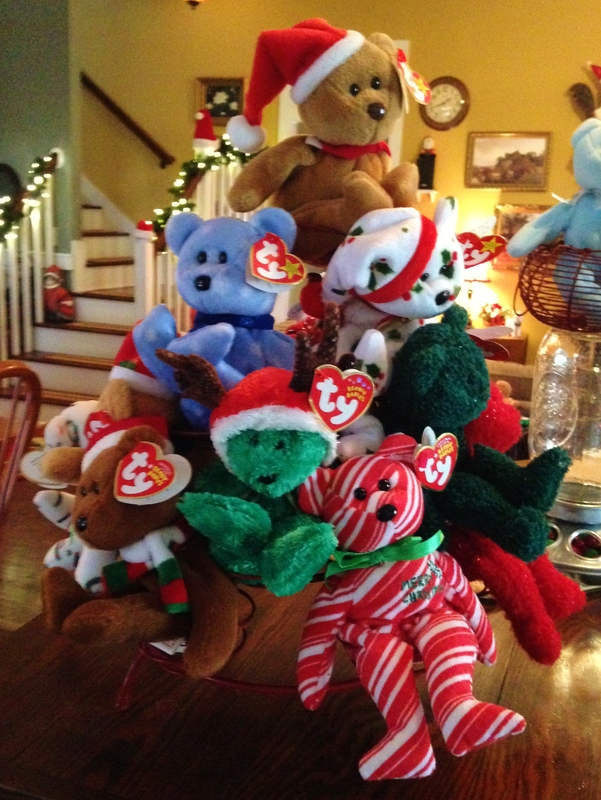 The Beanie Babies are doing their part to add to the festivities, but more on this in a later post. Be prepared for Christmas Beanie overload! 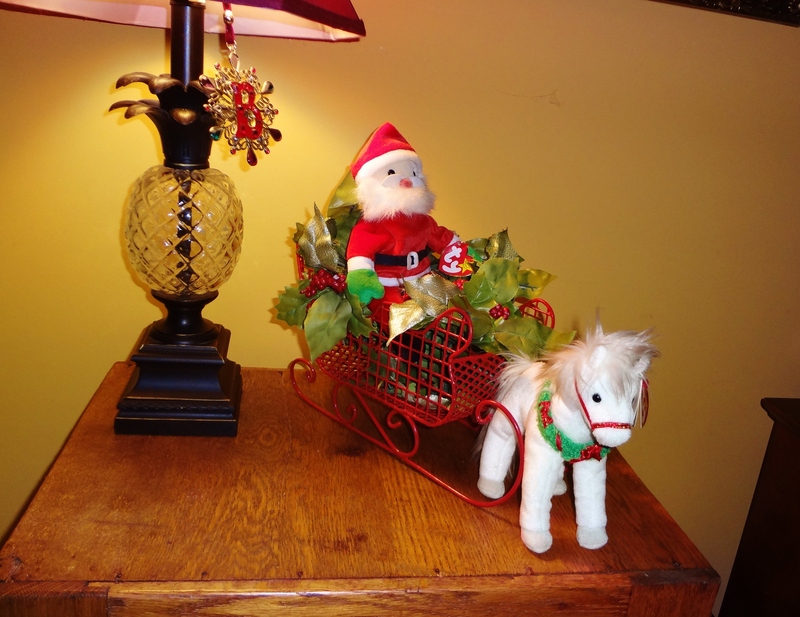 Santa and his Christmas pony are just the tip of the iceberg! 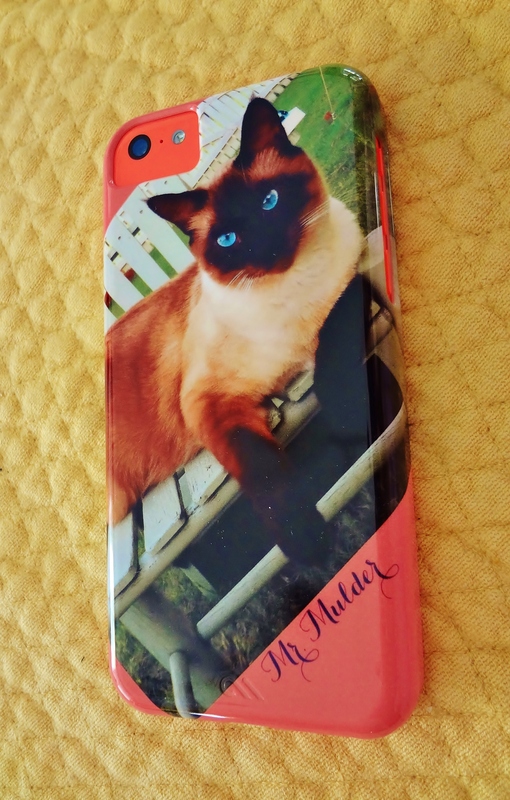 And in news completely unrelated to the holiday season, I upgraded my iPhone and designed my own cover. And Mr. G.T. 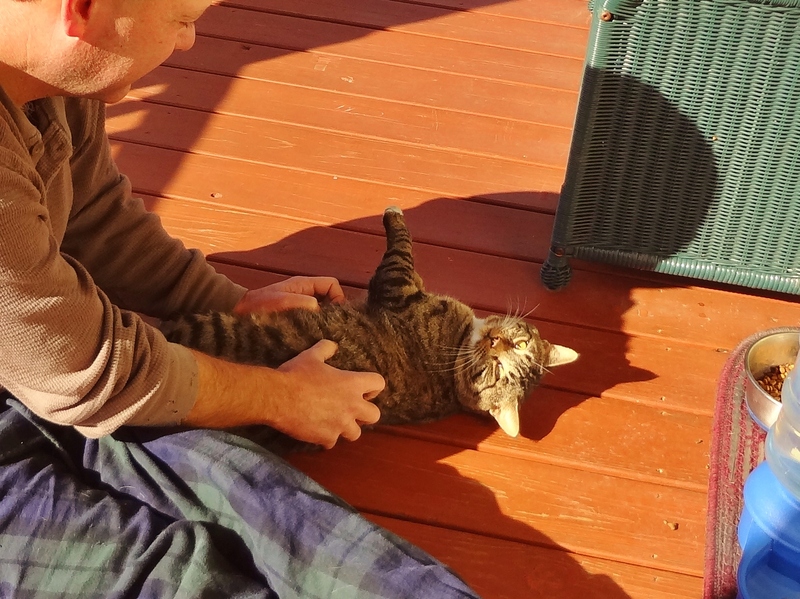 regularly relents to intense scratching sessions with his adopted dad. A little on the right please. Don’t stop, don’t stop! 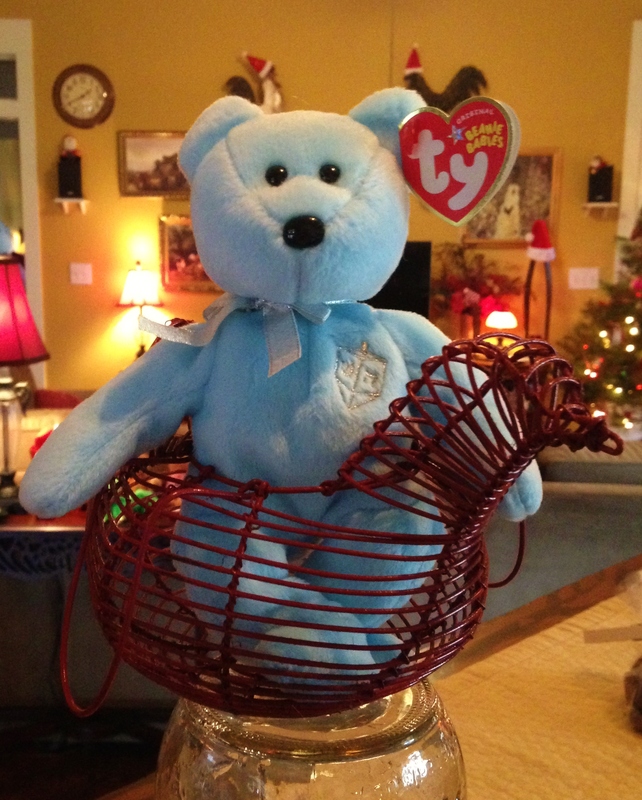 Our tenant moves out on December 30th and the accumulation of “stuff” has begun in earnest. 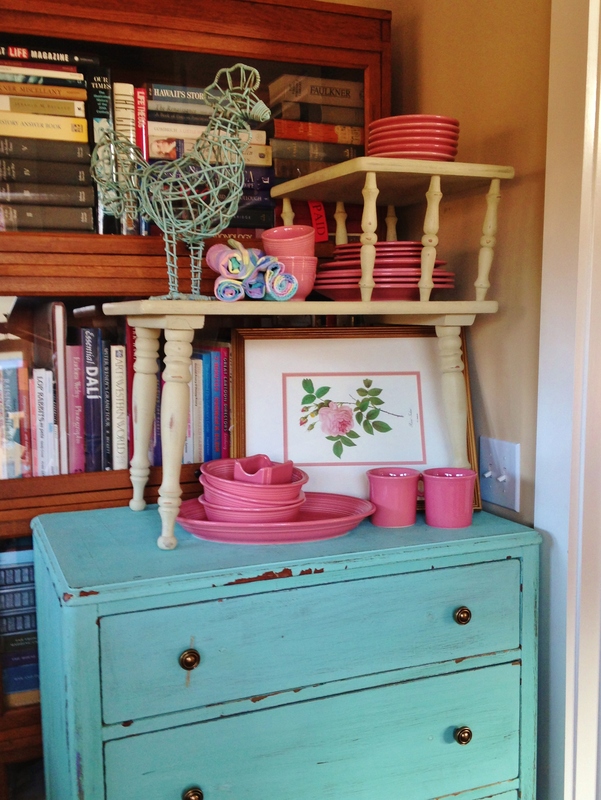 I’m shopping flea markets and thrift shops and having a blast “playing house”. Our target date for our first night is February 1st. We need to completely trick out the little house in preparation for turning it in to a VRBO, and although it’s going to be a lot of work, I’m enjoying every minute so far. And finally, after seven years of living in this golf cart-friendly neighborhood, we finally bit the bullet and joined the “club”. 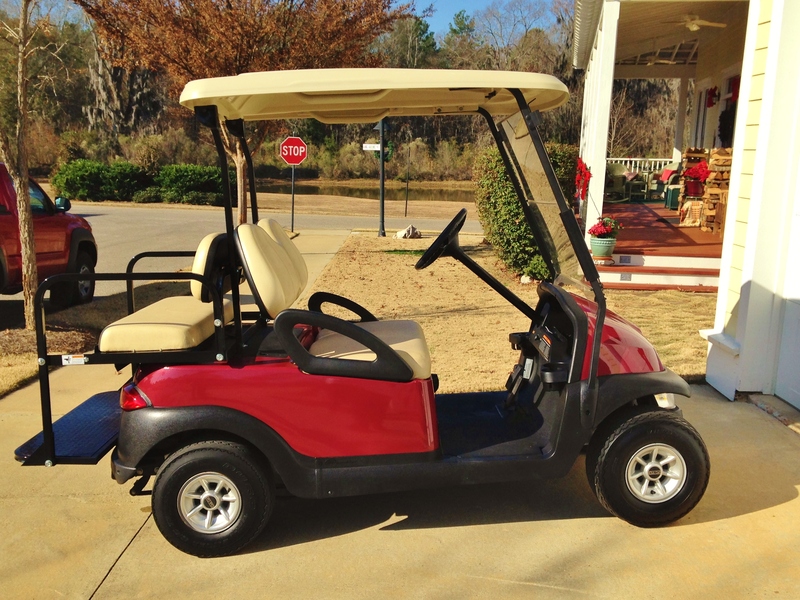 The cart will be included for use in the VRBO, but when visitors aren’t using it, you find Jim and Deb tooling around in this little burgundy beauty. 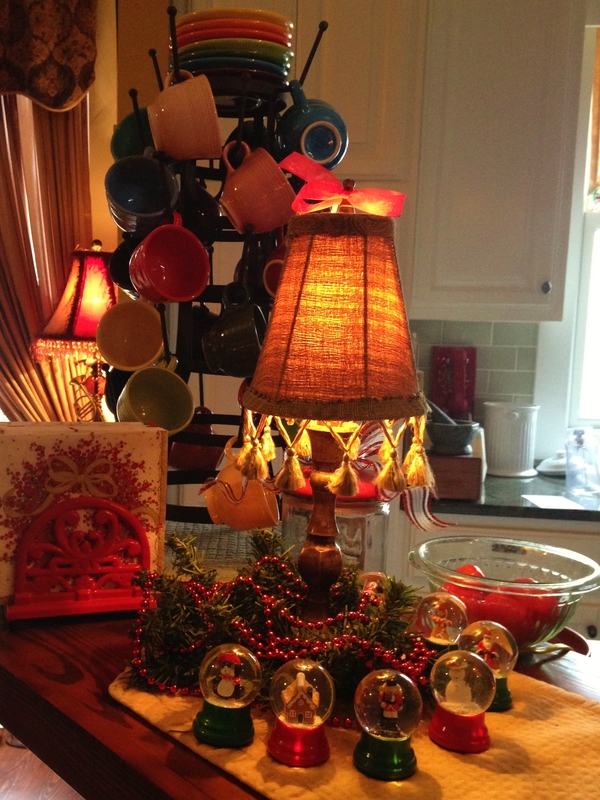 I wish for my readers lots of family, fun and food; plus the joy and peace of this meaningful season.